Building a SaaS company takes an enormous amount of work, but the fundamentals aren’t difficult to understand. You acquire customers, monetize them in some manner, and then retain them as long as possible. Of course, that’s easy to say in theory, while the reality of building becomes much more complicated. Knowing where to focus in each of the three pillars (acquisition, monetization, or retention) can be quite the challenge, particularly because there’s so much going on. To help though, we’re inundated with countless pieces of advice and data. Unfortunately though, our search for benchmarks around churn, growth, etc, revealed one thing: All of the benchmarks we found were wrong (and not by a little bit). VCs, operators, industry analysts, and the like are all giving conflicting and often data less pieces of advice around where your churn should be, how much you should be growing, etc. This isn't necessarily anyone's fault; SaaS is a young vertical, so there isn't a whole lot out there. Yet, the implication of incorrect benchmarks is that you end up focusing on the wrong pieces of your business, or worse, leave yourself with a ticking time bomb. To help prevent you from getting a false sense of security (or anxiety), let’s walk through some highly qualified benchmarks around churn, expansion revenue, and growth. The first rabbit hole we went down involved churn, specifically gross churn. When searching quora and google, we found that most folks wouldn’t give a definitive answer to the question, punting with “lower is always better”. While absolutely true this is tantamount to “well we can build anything” or “well, it depends”, because it really doesn’t give much direction. Folks who did give answers shockingly talked about how a 5% monthly gross churn rate was acceptable if net retention was over 100%. While potentially true, 5% is out of control, as you’ll see in the data below. We put together data from 612 companies across a spectrum of sizes and industries. 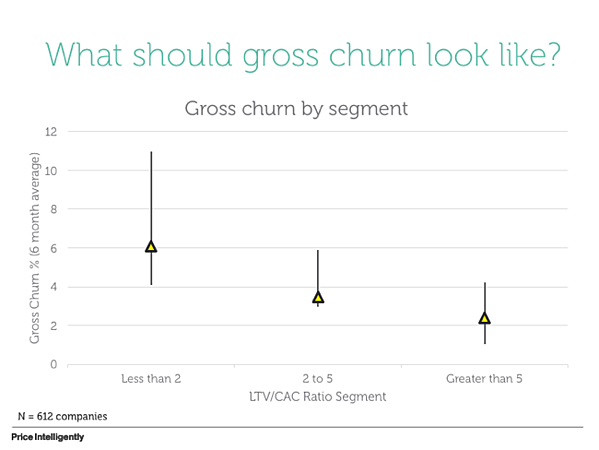 While there’s certainly room to break this down further (and we will in future posts), we chose to compare monthly gross churn rate to the company’s LTV/CAC ratio mainly because that normalizes the comparison as much as possible. As far as we know, this is the largest data set out there that includes CAC. Notice how that “5%” benchmark is exceptionally high compared to the more successful companies with higher LTV/CAC ratios. 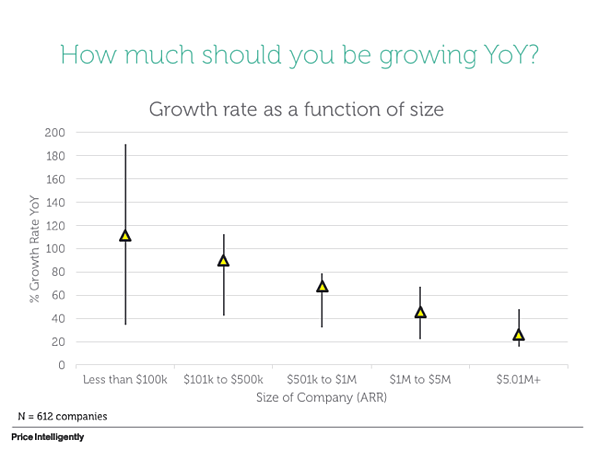 Note that the benchmark for LTV/CAC you want to hit is 3 or higher, meaning for every dollar you put into yoru customer acquisition cost, you’re yielding $3 in lifetime value. Long story short, if you’re not pushing your monthly gross churn rate lower and lower, you’re absolutely getting left behind. The rise of “Customer Success” has given new importance to expansion revenue and making more money off existing customers. Companies like Gainsight, Totango, Intercom, and Drift are all looking to help you make more money through your existing customers. Yet, most searches of Quora/Google revealed that the general advice was to make sure that 10-15% of your revenue was coming from your existing customer base. While we should aim for “as much expansion revenue as possible”, data revealed that the companies doing extremely well, actually had much higher amounts of their revenue coming from existing customers. 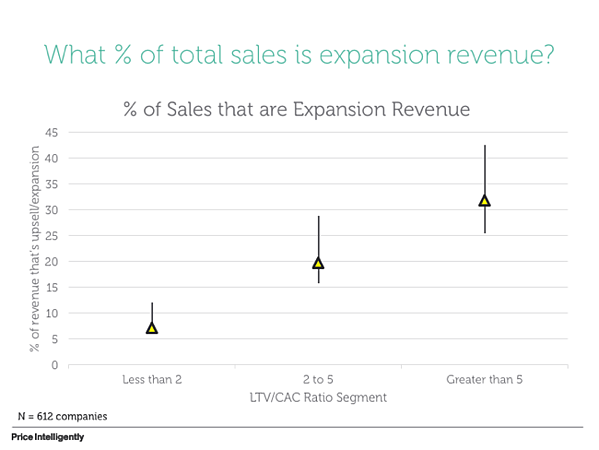 In fact, the companies that are doing extremely well (LTV/CAC of 5 or higher) have three times the expansion revenue of the floundering companies with LTV/CAC of less than two. In terms of Growth Rate, more is definitely better, but most of the benchmarks out there prop out a lot of baseless expectations. “You need to triple, triple, double, double, double” is decent advice from Battery. Yet, while this meets an exit requirement of raising to the summit in a venture environment, there isn’t a ton of data to support that this is the way to build your business. Contextually, the SaaS environment is changing drastically anyways, revealing that triple...double...etc may not actually be aggressive enough. For the following data we changed things up a bit, because comparing ARR was a bit more helpful. Notice how very few are tripling, let alone doubling in the data; most aren’t even coming close to making that cut. Does this mean you can ignore their advice? Absolutely not. There are expectations that come with a partnership, but most of the data reveals that we’re woefully underperforming compared to that advice. Most of this data likely causes more questions than actually answering. Realizing that we're busy working on bringing you more in-depth cuts, as well as much more context around the make-up of the companies in the above. If the data reveals anything though, it's this: make sure you're qualifying and keeping track of where you should be in your business. There's nothing worse than thinking you're doing ok with a particular metric and then discovering that you're actually in a world of hurt with too much churn or not enough focus on your existing customers.